I Have already take a brief look on Bauckham's book, but never read. Will you produce a review? Thanks for the comment. If time allows I hope to offer some sort of summary of the book as a future blog post. 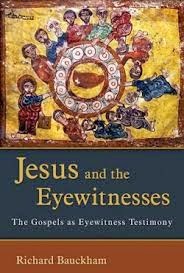 It does have a lot of interesting information challenging, in particular, the form critical approach to the Gospels and the life of Jesus. Worth reading but very dense.